Northwest Funeral Chapel has been in operation since 1993. It was established by Mrs. Ernestine O'Bee, Mr. William Ford and Mr. J.C. Frazier It provides funeral services and related merchandise to families in Milwaukee and its surrounding communities. • Removal, embalming, restoration, dressing and other preparations of the deceased for burial, entombment, cremation or shipment to destinations within the United States and foreign countries. • The sale of quality caskets, vaults, clothing, flowers, funeral programs and other related materials. • The arrangement and conduction of traditional and non-traditional funerals; coordination with other agencies for interments, entombments and cremations. • Assistance with the preparation of insurance claims, Veteran Administration, Social Security and other documents. • Coordination with state, county and other agencies to effect the proper and dignified burial or cremation of indigent persons. • Pre-Need services fro pre-arrangements of funerals and the establishment burial trusts, insurance funded trusts and insurance policies for final expense coverage. • After-care services through Surviving Spouse Support Group activities and coordination with local churches and other agencies to help meet the needs of the bereaved. Its locations, facilities and the reputation of its staff and management distinguish it from other funeral homes in the community. It has spacious and attractive chapels, a complete on site selection room, modern vehicles and equipment and a Family Resource Center that is used for repasts, public education seminars and other activities which clearly identifies Northwest Funeral Chapel as a leading funeral establishment in the African American community. Northwest Funeral Chapel has continually served and supported churches of all faiths. It has worked with fraternities, sororities, Masonic and Eastern Star organizations, motorcycle clubs and a myriad of other groups to provide meaningful services to bereaved family members and friends. Northwest Funeral Chapel presently operates from facilities in Milwaukee and in Racine, Wisconsin. It currently has a staff of six Licensed Funeral Directors and a group of some sixteen other well trained and caring staff members who provide professional support and assistance to families before, during and after the funeral. Northwest Funeral Chapel serves the community 24 hours a day (including weekends and holidays) and its offices are open daily from 9 a.m. until 7 p.m.
Mr. J.C. Frazier is a native of Shreveport, Louisiana and has been part of the Milwaukee community for over twenty years. He is a retired U.S. Army Officer and has been a Funeral Director for the past fifteen years. He has served hundreds of families in Milwaukee with the O'Bee Funeral Home and now with the Northwest Funeral Chapel. Mr. Frazier holds an Associate Degree in Funeral Service and a Master's Degree in Business Management. He serves on the Funeral Director Examining Board with the Wisconsin Department of Regulation and Licensing and he serves on the Milwaukee Area Technical College Funeral Service Advisory Board. Mr. Frazier serves as a Deacon with the Pilgrim Rest Missionary Baptist Church; he is a member of Phi Beta Sigma Fraternity and is affiliated with a number of other organizations in our community. 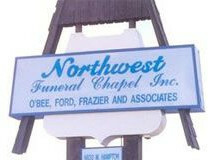 In his role as a licensed Funeral Director and Corporate Officer with Northwest Funeral Chapel, Mr. Frazier worked with Mrs. Ernestine O'Bee and Mr. William Ford to organize and operate one of the largest funeral establishments in Milwaukee. He has provided opportunities for the training and professional development for a number of Funeral Service Apprentices who have become Licensed Funeral Directors. Mr. Frazier developed a Surviving Spouse Group and has worked with a number of local churches to provide Bereavement Support Ministries for family members who have lost loved ones.